My friend Jonathan Mendez of Yieldbot asked me a question about the pace of adtech investing so I pulled together some numbers. I also posted some of them in response to a question on Quibb, so I figured I might as well throw the numbers into Datahero and explore. I did some cursory data cleaning and then hand-coded the companies by region and ‘type.’ Note that the SV region includes both Silicon Valley and San Francisco. The types I used are Buy-side, Sell-side, Ad nets and exchanges, Analytics, Data, Tech (includes ad servers and general adtech tech providers like The Trade Desk and AppNexus), Mobile, Video, and Social. I did not include any search-oriented firms, this is just display. The regions are broken out a little more in this one. London, as the largest international region, is broken out from the rest of Non-US here and Mid-Atlantic and the Pacific Northwest are also broken out from Other. The only interesting thing here is that SV and NYC are each twice as big as any other region. SoCal is the third biggest region; they’ve always been a player in adtech, probably due to their loose morals*. This one is more interesting. I don’t really trust the 2005 amount because Crunchbase is especially sketchy in 2005. And note that the 2013 amount (as in all the graphs) is year to date as of end of August, so it is not really comparable to the others. In any case, you can see the ramp up to 2008 and then the wintry 2009 you all remember. Then the ramp back up to 2011 and a fall in 2012. No surprises. If I annualized 2013 year-to-date (which would be bad practice given investing seasonality, but whatever) you would see that 2013 is on track to be slightly smaller than 2012 (about 1% smaller.) But if you believe, like I do, that the weakest fund-raising climate was second half of 2012 and first quarter of 2013 then 2013 should come in larger than 2012. This one is more interesting, because it’s not immediately obvious to the naked eye without seeing the data. 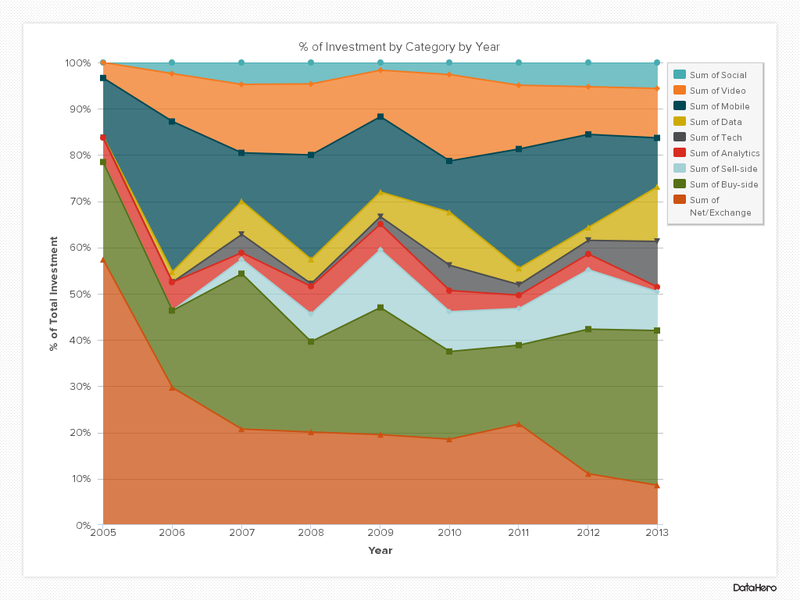 It shows how the investment dollars are allocated across types over time. In 2005 most of the money went into ad networks/ad exchanges: the rest of the ecosystem was just getting started. Mobile and Video ate into that in a big way in 2006. Then the buy-side (DSPs, AMPs, retargeters, etc.) became the largest category, starting in 2007 and with the exception of 2011. The importance of ad nets has declined pretty steadily over time. Mobile had a resurgence in 2011 and then fell back. Video, for some reason, has never been a huge share. Neither has social, although I think that this piece will continue to grow**. 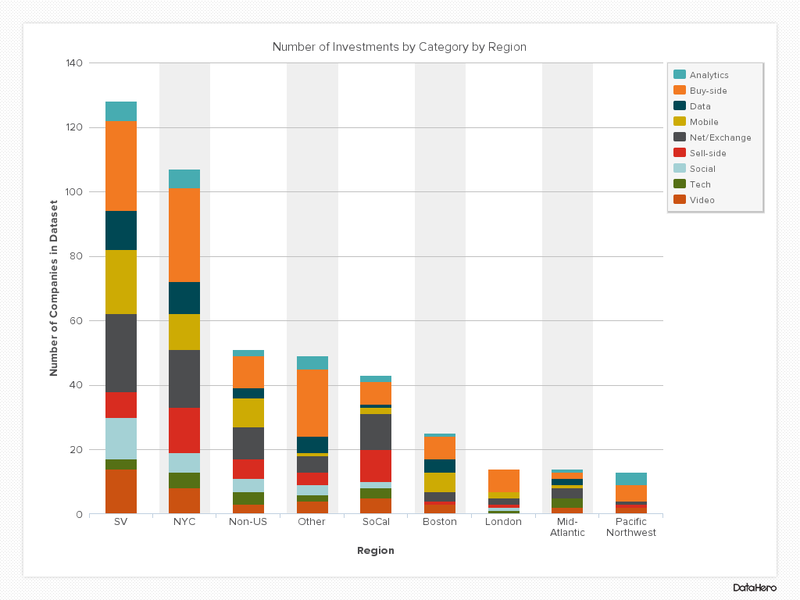 This next graph holds no surprises: the amount of money invested in adtech by region. Note that this is the region of the company being invested in, not the investor. NYC and SV lead, of course. This graph drills down on those two, and is a bit more interesting. Seems like more money was invested in NYC in 2005 and 2006 than in SV but then Silicon Valley took the lead, until this year. 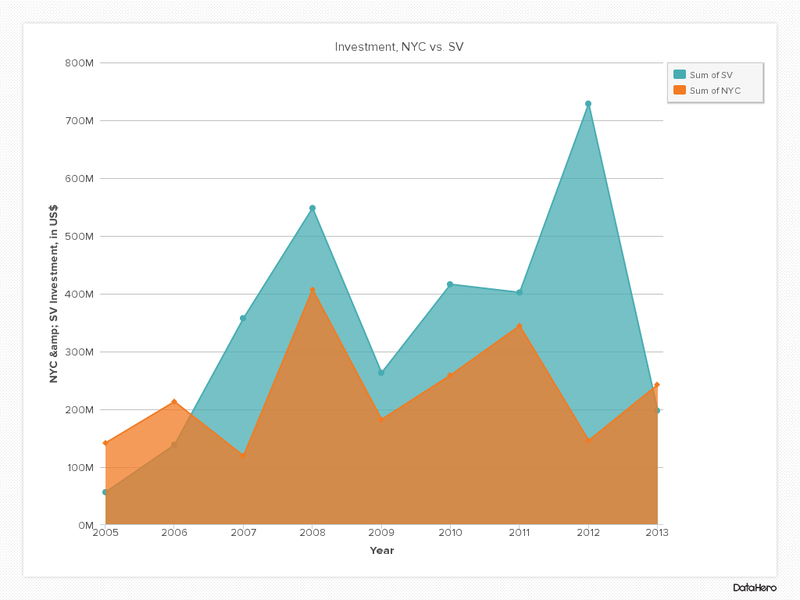 You can see this as a percent of the total NYC+SV investment in the next graph. 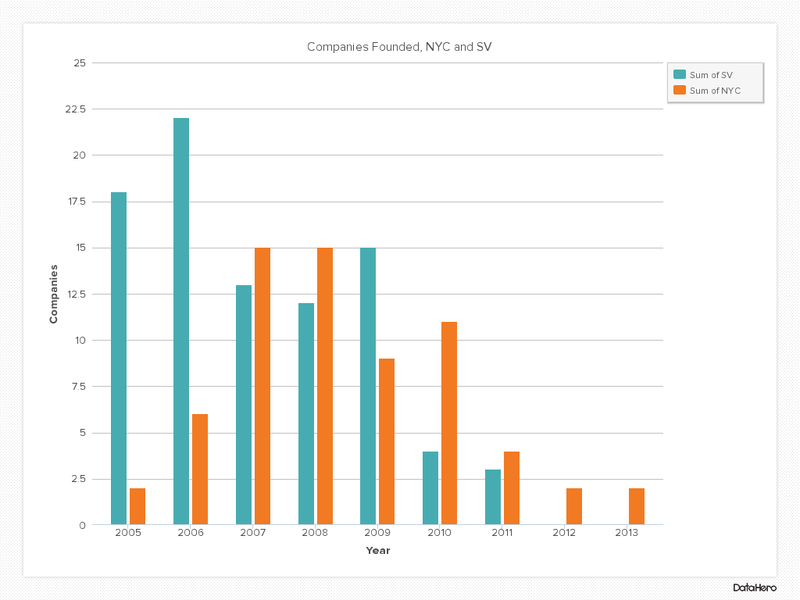 In 2012, companies in SV raised four times as much as those in NYC. 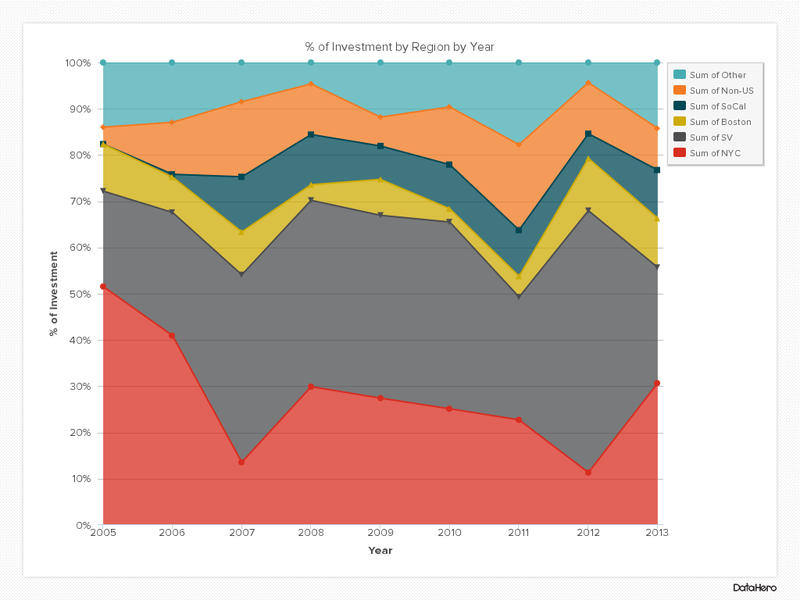 What’s up with Silicon Valley being the big recipient of investment in 2012? 2012 was not a great year to be an adtech entrepreneur in SV, after all. The answer reveals one of NYC’s biggest weaknesses as a startup hub. The graphs here are investments by round. 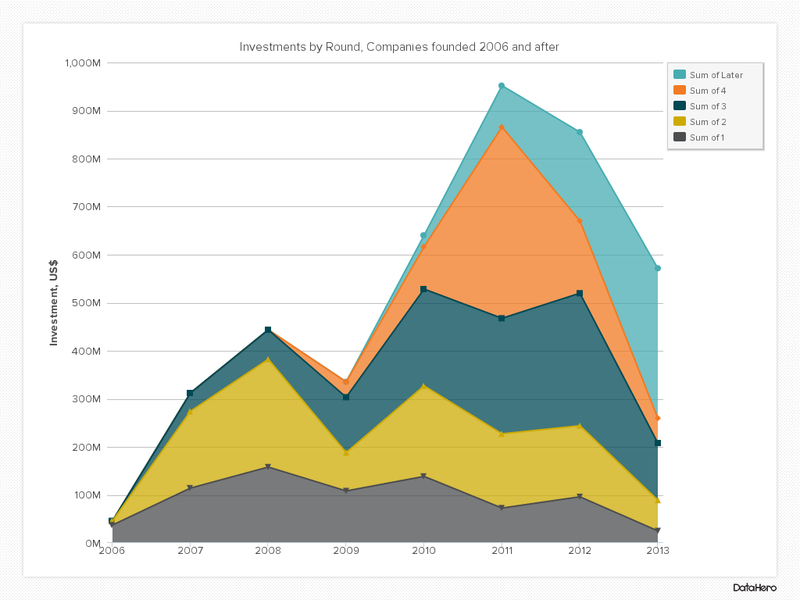 Crunchbase is especially bad at identifying what kind of round each round is (make sense of this, for example) so I took only the companies founded in 2006 or after and numbered the raises sequentially. The first time a company raised money is the first round, the second time is the second round, etc. I assume the first round is seed, the second is A, etc., but I labelled them as I found them: first round, second round, etc. This could lead to some apples-to-oranges stuff, but it beats trying to figure out which is the earlier of the Convertible Friends and Family Thanksgiving Extension Bridge and the Exploding Accelerator Put-Call Straddle denominated in square feet of loft space***. First round dollars gently peaked in 2008; this could be due to a couple of things: more companies founded, or that first rounds decreased in average size over the past five years. 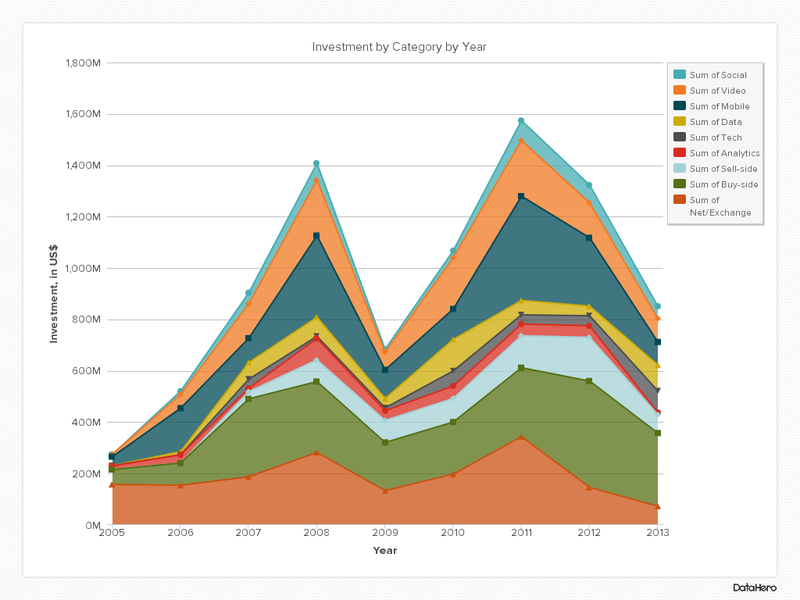 The increase in total dollars invested in 2011 is largely due to the increase in the later rounds, fourth and after (so, probably Series C and later.) This makes sense, as later rounds are bigger. This is offset by a shrinking not only of first rounds (seed) but also of second rounds (Series A) and of third rounds (Series B.) I’ll come back to this. Compare these next two graphs. 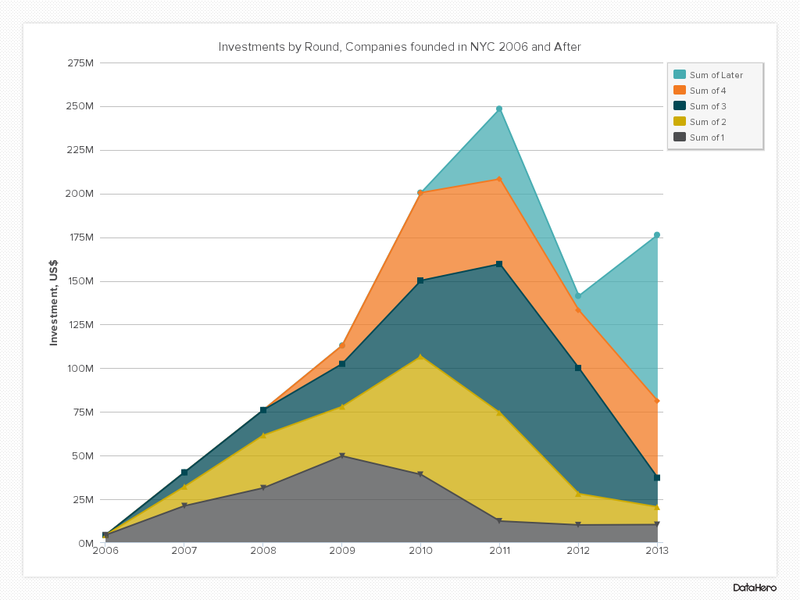 The first is investment by round in NYC companies. 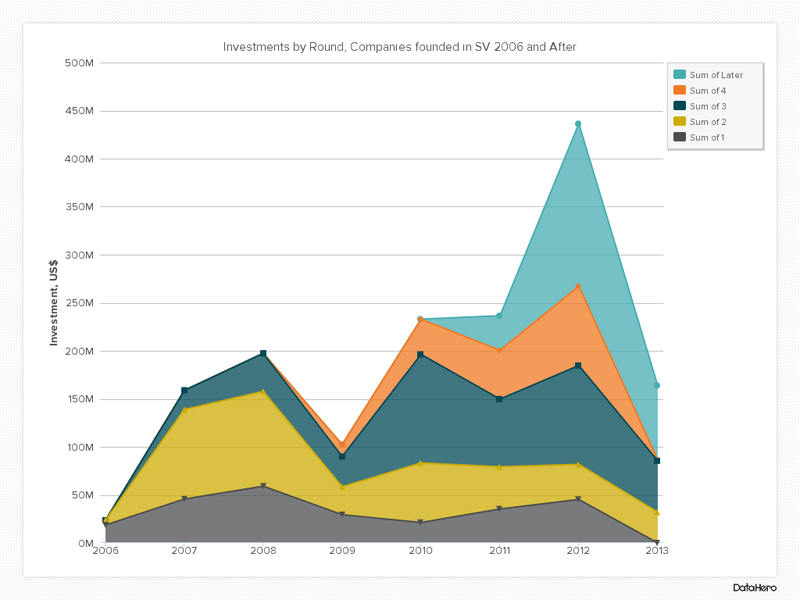 The second is investment by round in SV companies. Their shape is very different, no? Here’s my take on what is going on: NYC recognized the new adtech (real-time, data-driven) early and committed to it. SV came in later, but investors poured money in. This is one of New York’s biggest weaknesses: we have deep industry knowledge, but we don’t have deep pockets. In New York we understand our customers (there are like three major advertisers in all of SV compared to scores in NYC) but Silicon Valley is a fast follower willing to take big-money risks on technologies that are starting to prove themselves. When a New York company raises their first round bigger then $40 million, people usually say “what took so long?” When a Silicon Valley company does the same, people usually say “are those investors out of their minds?” It’s not that there’s a very different risk tolerance, it’s just that Sand Hill Road is in the high-stakes room and New York is out on the floor. Except in this casino, if you win in the high-stakes room you get to take the chips from everyone on the floor. It’s a problem. While I was writing this I realized I had assumed, given the industry talk of VCs funding a bunch of chaos in the ad industry, that adtech companies continued to be founded at a breakneck rate. That I personally was being pitched by fewer than I had been I attributed to the number of new investors who had familiarized themselves with the space since 2008, when I started investing in adtech. The graphs below disabused me of that. There are just fewer companies being founded. In fact, according to these numbers, in Silicon Valley in 2012 and 2013 no adtech companies were founded, zero. Now this is where Crunchbase data could be particularly out of whack. I know I spoke to many adtech companies in SV/San Francisco that were raising over the past year. That I didn’t invest in any of them did not cause me to consider that no one did (I was usually disinclined to from the start because of the concentration of adtech already in my portfolio, and I always let them know that in my first response to them.) It seems that, in fact, no one did invest, at least according to Crunchbase. Maybe there are investments that are still in stealth, so the investment hasn’t been disclosed; maybe there were companies where the investment was low-key or from an accelerator so it never made Techcrunch and thus never made Crunchbase; maybe the gap between founding and getting funding has gotten longer so these companies just haven’t hit the press yet; maybe the companies are simply not describing themselves in a way that would pass my adtech filter because they don’t want to be put in a box on the Lumascape with twenty other companies. I don’t know. It seems implausible to me that barely anyone is starting adtech companies anymore. But it’s not implausible that far fewer adtech companies are starting, that’s almost certainly true. To put a finer point on it, the second graph is NY and SV starts per year. 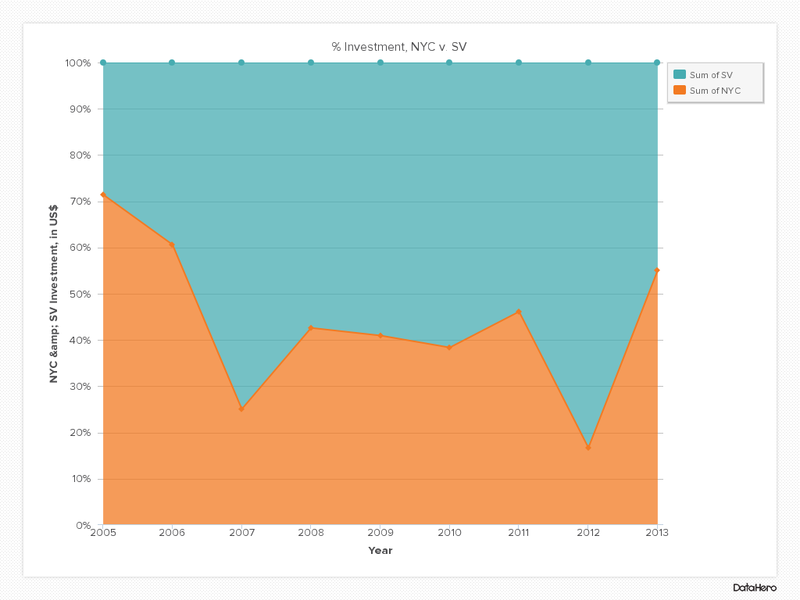 Both SV and NYC have seen a pretty drastic boom and bust in foundings, although more pronounced in SV than NYC. On Quibb I quibbled over Andrew Chen’s comment that “adtech is definitely out of favor with VCs” by showing that investment in adtech is still high (as per graph 2, above.) Maybe what he meant is that funding new companies is out of favor, and that looks to be true. To a contrarian like me, it looks like an opportunity. * Ha! That was a joke. Well, not really. ** And, it could be that the companies that will be the social adtech cos did not all fall into my filter because they can look like something else, like publishers. *** I’m still punchy from having to come home from vacation. Most VCs I know have stopped investing in adtech. The perception is that it’s almost impossible to create a stand-alone successful company because it’s so hard to build a moat against other startups and even more so giant incumbents like Google. That’s a shame. Advertising is a $500B global business that is being disrupted by sea changes on two sides – consumer behavior & data. It’s as ripe for innovation as just about any market. If history is our guide the fact that most VC have lost interest means it’s probably the best time to be investing in it. I suppose the same could be said for almost all enterprise software companies–they’re all competing with some larger player: Oracle, IBM, Microsoft, Salesforce, someone. It looks like you’ve excluded Native and Inbound, and only minimally included Social. That seems a bit like talking about telcos but only including telegraph co’s. I’m not surprised that in 2013 that’s not where the new action is. Name the companies I’ve overlooked and I’ll add them to the list.